All of the things that have been described and utilized so far need to be pulled together by an intelligent device, a PICAXE microcontroller, and a program that tells it what to do. When I start a project like this I like to come up with a list of things that I would like the finished device to do. The list of objectives below are the things that the microcontroller must do to manage the proper operation of all of the individual modules. Are all three trains waiting at their sensors? Has train 1 cleared its sensor? Has train 2 cleared its sensor? has train 3 cleared its sensor? Checks the trains that are not running to make sure that they are still at their sensors. If it finds that a train is not where it is supposed to be all blocks are shut down and an error message is reported. Looks for activation of a radio controlled switch that tells the system to stop all trains once the currently running engine returns to its block sensor. This is an easy for the operator to shut things down at the end of the day. The one thing that is not included in the schematic is the LCD display. To simplify the project and speed its time to completion I opted to use an external LCD display controller. This is a chip from www.phanderson.com that accepts serial input at 2400 baud and displays the information that it receives on a 4 line X 20 character backlit LCD display. A complete description of the chip and its use is available at: http://phanderson.com/lcd106/lcd115.html . This unit and others from Peter Anderson are highly recommended. The software listing is below. It is fairly well commented and, for the most part, follows the logic that is described above. The items following SEROUT are text strings and commands that go to the LCD controller. 'NOTE SensorValue must be set on first run with MENU!!!!!!!!!!!!!!!!!!! The user interacts with the unit through two buttons on the control panel, Menu and Enter, and a third that connects via the hand held Aristo-Craft remote control unit. The LCD display continuously shows each engine's progress as it navigates the layout. It also shows the switch status and number of laps that have been completed. The three "DIODE VOLTAGE CONTROL" switches control the speed of the trains once they enter a controlled block. The "NUDGE FORWARD" buttons allow you to manually active a block to move engines into position blocking sensors. 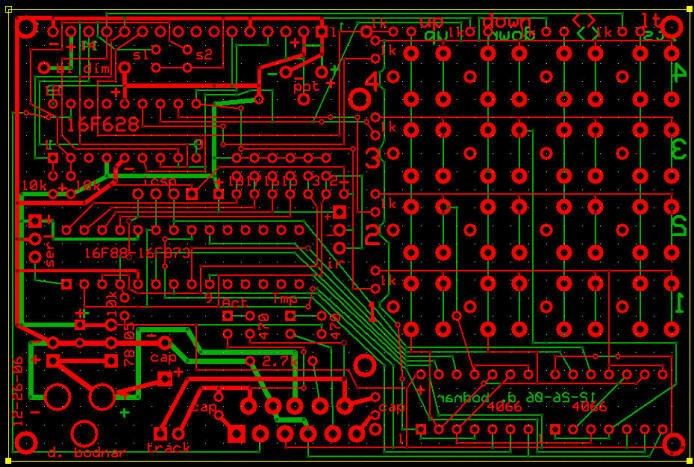 The circuit board in the lower left corner is for the PICAXE and switch controlling H-Bridge chip. All of the external connections are in the lower left. Switches connect to the left. Under the word "Sensors" is the telephone cable that goes to the sensors. The block power cables are under "Blocks + 1 2 3". The connection on the schematic that is labeled "END switch / Sound 1 or Sound 2 on receiver" is the one that goes to the radio control accessory receiver, pictured below. This item is normally used to activate sound, lights or switches with the Train Engineer hand-held radio control unit. When properly configured pressing one of the accessory buttons on the transmitter activates the "END" switch on the controller. In this photo it is temporarily connected to a switch motor for testing. When first powered up the display shows copyright and version information. It then resets all of the switches and checks that all sensors are blocked by engines. If it finds that a sensor is not blocked it briefly applies power to the appropriate block moving the engine into position. This repeats till all sensors are blocked. Once all of the engines are seen to be in position the user is asked to press ENTER to begin. At this point the engines leave and progress through the layout as previously described. One after the other one engine exits as the other two wait their turns. You may notice that the display in one photo shows "Trains = 3". The layout that is controlled by this system is actually made up of two independent loops, one with two trains and two sidings and the other with three trains and sidings. Rather than make up two different systems, one for two and one for three trains, I chose to make two identical units. Either of them can be configured in software to control two trains or three. Even though a two train controller would have been much simpler to construct, in the long run it is easier to maintain only one design and one software revision. As you can see this was something of an epic project to build and document. I hope that some or all of it was of interest to you and can be incorporated into your layout. Control & software - to meet the design specifications for this system a DCC controller would need to be hooked up to a laptop or other computer and software would need to be purchased (or written). Programming would still need to be done to automate the train operation. An individual controller would need to be installed in each engine. I have really gotten used to adding "Stay Tuned..." to the end of each of these articles so I think I'll do it one more time so I can give a little peek at my next train automation project. In spite of what I said above about DCC it is an interesting technology and there are some advantages to using it. This is especially true if one can utilize a custom made DCC control system. Over the last few months I have built a few DCC controllers and am close to finishing up a PIC based control unit that duplicates much of what the controller described in this series can do.